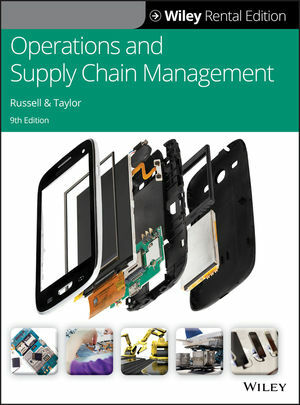 Russell and Taylor's Operations and Supply Chain Management, 9th Edition is designed to teach students how to analyze processes, ensure quality, create value, and manage the flow of information and products, while creating value along the supply chain in a global environment. Russell and Taylor explain and clearly demonstrate the skills needed to be a successful operations manager. Most importantly, Operations Management, 9th Edition makes the quantitative topics easy for students to understand and the mathematical applications less intimidating. Appropriate for students preparing for careers across functional areas of the business environment, this text provides foundational understanding of both qualitative and quantitative operations management processes. The newly updated ninth edition is organized around the important and prevalent topic of operations as the creation of value along the supply chain. NEW Topics: New material has been added throughout the book on sustainability, corporate social responsibility, and risk and resilience. NEW and UPDATED “Along the Supply Chain” boxes: Over 45 new boxes that describe real world business applications of OM topics at companies around the world. NEW Supply Chain Example of Electronics: To help show how the OM topics in this edition fit together within a supply chain framework, the authors open each chapter with a specific example in the electronics product group, smartphones. WileyPLUS with ORION is an online teaching and learning platform that helps you and your students achieve educational success. WileyPLUS identifies learning trends early, organizes learning to show connections between assessment and learning content, and monitors progress to develop work ethic and reasoning skills. WileyPLUS provides students with unique study strategies, tools, and support based on learning styles for success. Creating value along the supply chain framework: Helps students learn how to analyze processes, ensure quality, and manage the flow of information and products in the context of creating value along the supply chain and making companies more successful. Excel files and solutions automate the use of analysis tools and techniques, while helping students automate computation and make quick managerial decisions. Global operations: Examples in each chapter show the impact of global operations and how globalization affects operating decisions.